Tired of the same old Tupperware that you use for your lunch every day? Well, LunchBots provides a great alternative. 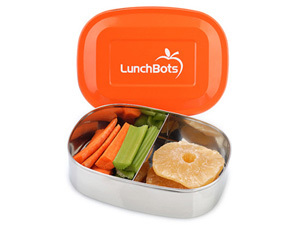 Eco-friendly LunchBots are lunch and snack containers made from the highest quality 18/8 food-grade stainless steel. Even the lids are stainless steel, so there is no plastic anywhere in their makeup. Ideal containers for packing a sandwich, sushi, burrito, or whatever you might want to stow away for lunch. LunchBots are perfect to tuck into the kids’ backpack as they head off for school or your briefcase before you depart for work. You know me I LOVE eco-friendly lunch ideas! Visit HERE and you will see products I have come to love and easy to use everyday!